Is it safe to travel in New Zealand? Most people are considering New Zealand as safe destination and I agree with them. Never had problems walking in the cities at late night. It is more dangerous to drive during dark time because of cattle. There are 40 millions sheep in New Zealand, so no surprise that some of cattle you can meet in the middle of the road, especially in more remote parts of country. But it is probably not big difference from other countries then common sense caution should be considered on the road. Difference is other tourists who didn’t use to drive on left side of the road. It is beautiful country and so many drivers are forgetting about looking to the road. So be careful on hidden turns in mountains as some cars can suddenly turn to your side of road, or even yourself can do so. Keep left! Although biggest dangers I faced in New Zealand are not cattle or other drivers, but thieves. It seems people after awhile starting feel like there is no danger in New Zealand and relaxing too much. I gave a lift to German guy who was robbed in the hostel, met couple whose campervan was robbed and heard a lot of similar stories. 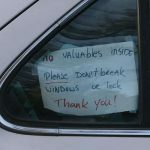 Don’t allow your holidays to be ruined and don’t leave any valuables visible in the car/campervan. When going for longer walk/hike/tramp take your documents with you. If you loose money, you can ask your relatives or friends for money transfer, but to get new travel documents/passport can be very long process. So be careful and enjoy your holidays in New Zealand. Share your thoughts if you know any other tips.